Since saying farewell to the University of North Carolina's Radio, Television, and Motion Picture program in order to establish Lloyd Street Studios, Ltd, in 1981, Andy Church has been working constantly to improve his knowledge and skill as a recording and performing musician. 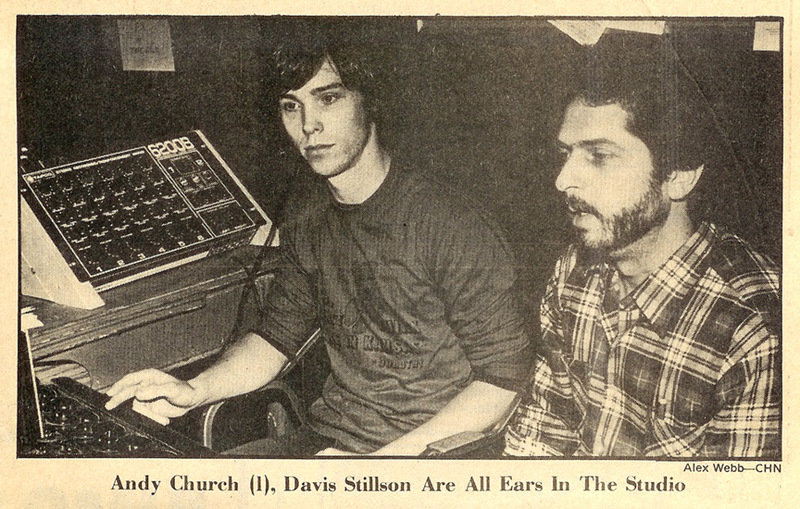 As the MIDI standard was being adopted in 1983, Church was invited to join the staff of B&B Music, an independently owned combo shop in Chapel Hill's Eastgate Shopping Center. There he undertook to learn and share as much as possible about a full range of products, including electric and acoustic guitars, bass guitars, amplifiers, drums, keyboards, pro sound, lighting, and recording gear. B&B Music was bought in 1985 by the Durham-based Music Loft, at that time on its way to becomming one of the nation's most successful privately owned regional combo music chains. Andy helped run the Music Loft's Carrboro location for nearly 20 years, providing instruments, equipment, service, and advice to Chapel Hill/Carrboro area musicians... including their parents, wives, husbands, and friends, as well as the many touring artists passing through town. Playing in a number of regional bands along the way, including Rick Rock (now known as Parthenon Huxley... see below), Cream of Soul, and Cat Baby!, Church not only appeared onstage in thousands of shows, he helped set up and tear down the stage each night, and was generally regarded as the primary troubleshooter (nicknamed "Doc") whenever technical problems arose. All the hours spent reading manuals did not go unpunished! Now living in beautiful Rowayton, CT, Andy focuses on writing and recording his own music. His first ever solo effort, Sleeping in the Van, is now available. Huxley left the democratic confines of The Dads to take a stab at running a band as a benign dictator with full control of the sound and songs. In 1982 he recruited drummer Chip Shelby and bassist Andy Church to help him achieve his vision and called the new trio Rick Rock, a nod to a joke from high school. Huxley wanted Rick Rock to explode on the Chapel Hill scene with full force--in both the Blazers and Dads he'd performed new songs live before an audience with verses missing or unfinished solo sections, and found it wanting. Rick Rock rehearsed at Chapel Hill's Lloyd Street Studios for nine months before appearing in public. During that time Huxley, Shelby and Church became a tight, formidable unit and Huxley's songwriting blossomed. During the nine-month rehearsal period, Rick Rock recorded a single at TGS Studios outside of Chapel Hill, the same studio where the Blazers had recorded. But this time, Huxley took the role of producer. The result was Buddha, Buddha b/w Sputnik. The sessions cost $400 total. A few years later the Greensboro Record called Buddha, Buddha one of the Ten Best Records Ever Made in NC. (James Brown's Papa's Got A Brand New Bag was #1). An opportunity then presented itself to the band. A new label, Dolphin Records, with backing from record store chain The Record Bar, was interested in putting out a compilation of NC bands. When Mondo Montage came out a few months later, Rick Rock was the only band with two songs on the album: Buddha and Sputnik. Rolling Stone quickly picked up on the album and writer Parke Puterbaugh gave Huxley his first memorable national quote: "You could land a marlin with these hooks!" With the Rolling Stone review in hand and heavy local airplay for Buddha, Buddha creating interest, on Valentine's Day of 1983 Rick Rock debuted as headliner at The Pier in Raleigh featuring bands from the Mondo Montage album. Huxley's vision of a band exploding on the scene had come true. The band played to a raucus packed house in its first ever live performance. Rick Rock shared bills with the Romantics, Berlin, and notably R.E.M. (When Rick Rock opened for R.E.M. the Raleigh crowd deafeningly chanted the band's name at the end of their set. Rick Rock obliged the crowd with an encore. R.E.M. guitarist Peter Buck angrily confronted Rick Rock's manager, Anistatia Renard, saying 'Warm up bands don't do encores!' Anistatia responded: "This one does!") More gigs followed and packed shows at the Cat's Cradle, the Pier and on the UNC campus are still fondly remembered by those who were there back in the day.